� BATMAN NOIR: EDUARDO RISSO spotlights the art of 100 BULLETS illustrator Eduardo Risso, which casts the Dark Knight in deep shadow on every page. 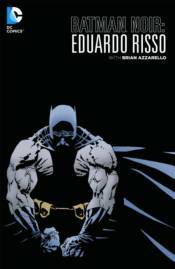 Written by his frequent collaborator Brian Azzarello, this title includes tales from a variety of Batman projects, including 'Broken City,' a profound examination of the Dark Knight Detective and the grim metropolis that he protects. While hunting the murderer of a small boy's parents, Batman is caught up in his own investigation and ruminations, only to fall prey to a deadly new pair of killers who have been stalking him. � Collecting BATMAN #620-625, the Batman serial from WEDNESDAY COMICS #1-12, FLASHPOINT: BATMAN-KNIGHT OF VENGEANCE #1-3 and a story from BATMAN: GOTHAM KNIGHTS #8.